“The Theology of the Hammer” is a term used by Habitat for Humanity founder Millard Fuller to explain the idea that we cannot just talk about our faith. We must put faith and love into action… by building homes, nail by nail; by finding common ground in using a hammer to manifest God’s love; and by bringing together a wide diversity of people, churches, and other organizations to build houses and establish communities. On November 1, Rev. Katie Klosterman from Foothills United Methodist Church conducted the house blessing for Tacoma/Pierce County Habitat for Humanity’s 2014 Building on Faith home. Building on Faith is an annual celebration of the partnerships between the faith community and Habitat. The first Tacoma/Pierce County Habitat for Humanity Building on Faith home was constructed in 2000. During the first few years, multiple homes were built through Building on Faith. 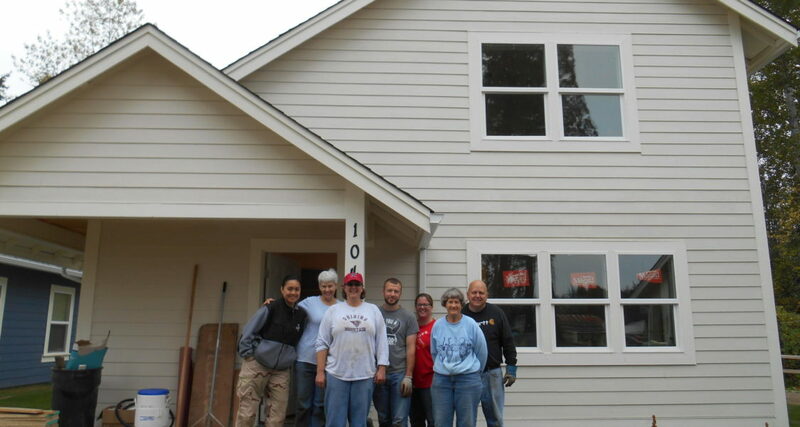 From July 9 through October 31, twelve faith groups from across Pierce County devoted their time to help build a home at The Woods at Golden Given. The most recent dedication marks the 30th Building on Faith home. Jen Livingood, a member of Foothills UMC who had volunteered with Habitat while in the military, spearheaded her church’s engagement with Building on Faith. She was new to the congregation and got to know many of her fellow members by talking about the upcoming build. “I’ve been pretty blessed in my life and see this as a great opportunity to do that for somebody else, to give them that opportunity,” Livingood said.